Located just outside the center of Idyllwild, this beautiful log cabin home is perfect for family gatherings and retreats. This is a gorgeous cabin nestled on a very private property surrounded by trees and all the wonders our hill has to offer. You enter into this cabin through the massive kitchen. This kitchen has all the comforts of home with high end appliances and everything you need to prepare a gourmet meal for two or breakfast for an entire family. A large table that seats 12 makes a great place to have a good old family meal together or possibly play board games. On this level there is a bathroom with vintage claw foot tub and a very large living room with a wood burning fireplace, cozy couches and chairs perfect for snuggling up with a good book or watching a movie with the entire family. Just outside is an expansive deck for bbqing or just relaxing with a glass of wine in the evening or your morning coffee. Plenty of outdoor seating so you can enjoy the great outdoors with family or friends. The surrounding trees are homes to many different types of critters including birds, squirrels, chipmunks, and you may even see a deer or two wandering through the yard. Very peaceful and lovely. Up the stairs there are three bedrooms and a full bath with a vintage claw foot tub. The master bedroom has a queen bed, the second has two twin beds, and the third has a double bed. Now back downstairs to the mid-level and down one more set of stairs to the lower level. This level is great! The perfect kid getaway with three sets of bunk beds and a twin bed with a trundle. Off of this room there is another private bedroom with a cozy double bed. There is also a 3/4 bathroom with shower on this level and a door that leads outside to the property. There's plenty of room for little ones to run, climb, and explore while still being under the watchful eye of mom and dad. 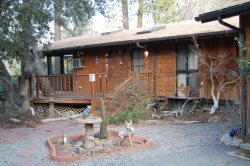 The amazing cabin is very close to the creek and about 1.5 miles away from the center of town and even closer to many of the yummy restaurants Idyllwild has to offer.